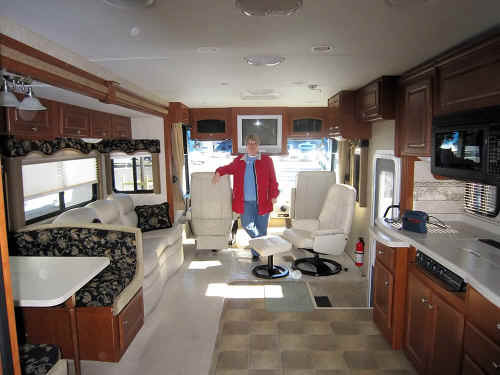 Gary and I have been planning for several years to do some traveling in a motorhome. One of the advantages of this kind of travel is that we can take our dogs along. 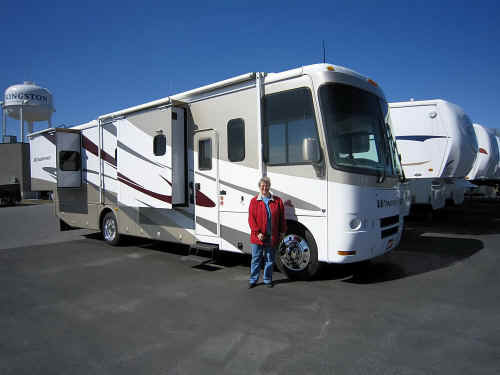 With that in mind, we asked good friends of ours, Dave and Christine, who own an RV dealership to keep an eye out for a good used unit with the features we were looking for. It took about two years since we first started discussing it, but our "ship" has finally come in. 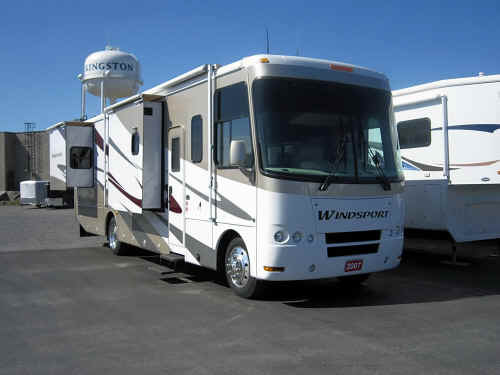 We are now the proud owners of a 33 foot Windsport motor home. It's exactly what we were looking for. 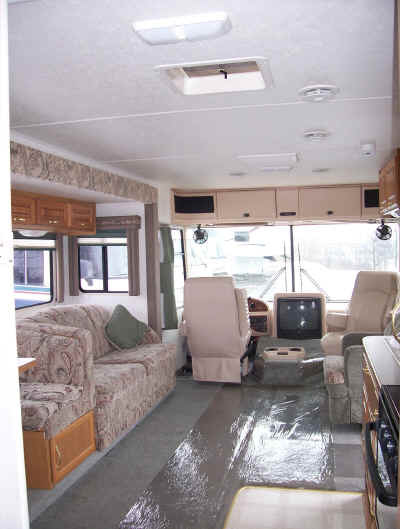 It has a 14 foot living room slide-out which adds lots of living area when you are parked. I like the colour scheme and Gary seems happy with all the mechanical aspects. He's already been out to buy a complete set of tools to carry in the new rig. I guess I shouldn't make fun of him though . . . I have already picked up dishes, pots, pans, linens and even a few small appliances. It's pretty exciting for both of us. 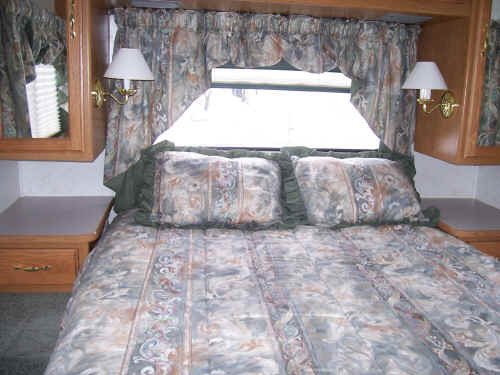 We will probably have a few short trips, short in both duration and distance, until we become familiar with motor home travel. 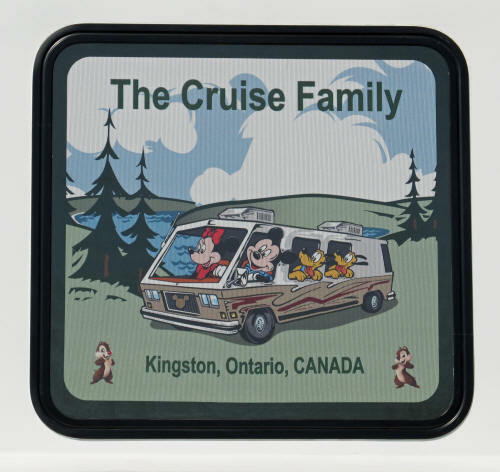 Our first long trip will be to the Fort Wilderness Campground at Walt Disney World (where else?) in April 2006. 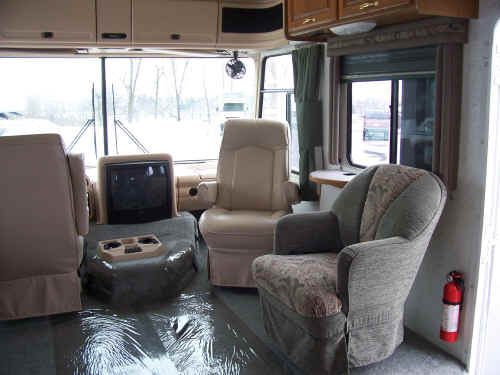 We have enjoyed our first four years of RVing so much that we have recently started to talk about some longer trips we would like to take over the next ten years. We pretty soon decided that our 1999 unit, which has served us well these last four years, would not last us ten more years. I made up a list of things we needed and wanted in our next rig and we let our dealer friends, Dave and Christine, know we were in the market. Within a week we were in their lot looking at a trade in that had just arrived. Wow . . . what a beauty! Within two days the deal was struck! 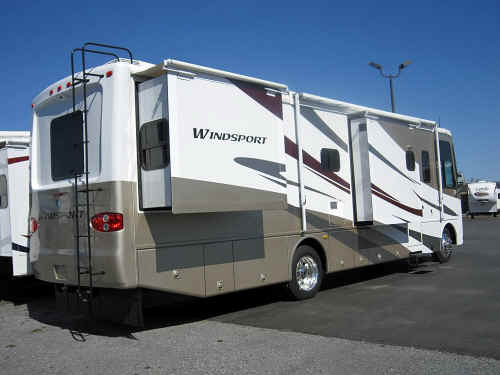 It's a 2007 Windsport Model 35B. It's built on a Ford truck chassis, just like our last one. The engine is a V10 and it only has 13,000 kilometers (8,000 miles) on the odometer. 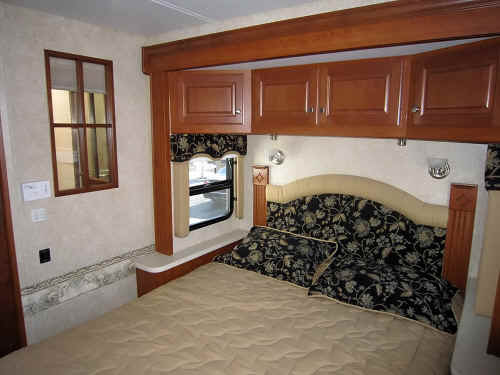 It's three feet longer than our first unit and there are three slide-outs which greatly expand the living area. 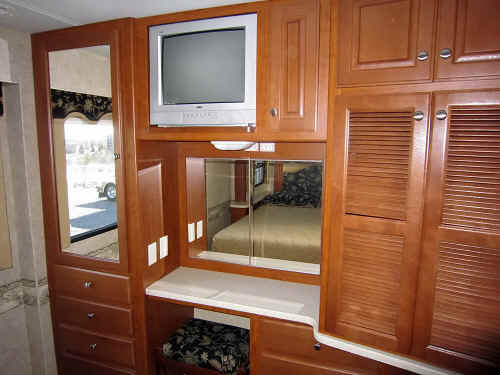 It's just loaded up with extra features like a convection oven, central vacuum and a computer work station. It's even "roughed in" for a washer and dryer and a satellite dish if we decide we need to add them. I just love it and can't wait to get on the road. Our next scheduled trip is April 21st when we leave for a week on Florida's Gulf Coast and a few days at Walt Disney World. Gosh, can I wait that long or will we have to take a test run locally? Decisions . . . decisions! 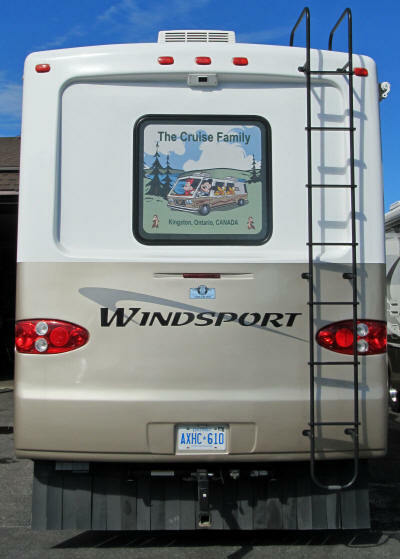 August 2011 - We've added a sign to the back window of the Motor Home to "personalize" it a bit! It's one of those perforated signs like on a bus window. We can see out but it provides a good picture on the outside! So if you see us on the highway - give a honk and a wave! All good things come to an end . . .
After a dozen years and almost 90,000 miles we managed to complete our RVing "bucket-list". We had a great run, we really enjoyed travelling with the dogs, but there were no more "big trips" in our plans. We talked for months and months about selling the rig . . . but we were both sort of reluctant to make the final committment. Then in May 2017 we mentioned to some fellow Disney fans that we were thinking of selling. Their eyes lit up immediately . . . within two weeks they drove away in their new rig. We both had misty eyes as they drove away. It's always tough to close a chapter in your life! As you probably expected, we just couldn't stay away from Fort Wilderness. 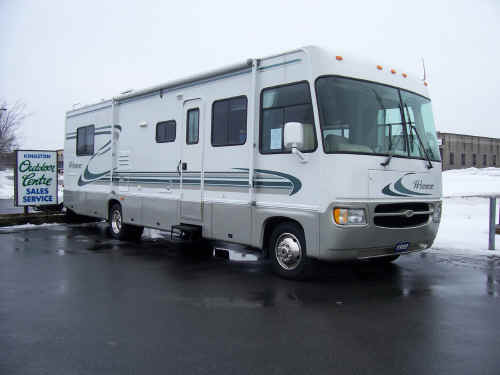 During our 12 years of motor home travel we logged 143,175 kilometres (88,965 miles) in it. We used 44,153 litres (12,202 gallons) of gasoline; that's an average of 32.24 litres for each hundred kilometres of travel. That's equivalent to 8.76 miles per Imperial gallon or 7.29 miles per US gallon. This is where our travels took Us!